In 2016, as a birthday gift, I decided to enroll in a hands-on cooking/baking class but soon turned into a Bean-to-bar chocolate making class. The class did not include the nuances of chocolate making but explained the general overall process of grinding chocolate from cocoa beans. I left the class with a 2 lb. bag of cocoa nibs which later had turned into my first personal chocolate bar. There was no turning back at this point, it had awoken my inner chocolate monster and I began to think of how cool it would be make my own chocolate and eat it too. Within two years, the doors to the chocolate world swung wide open. The science, technology, passion, and the madness behind chocolate making has created 'Dwaar Chocolate', my chocolate madness. At Dwaar Chocolate, our primary goal is to bring forth the subtle flavors indicative of the regions from which the cocoa beans hail. 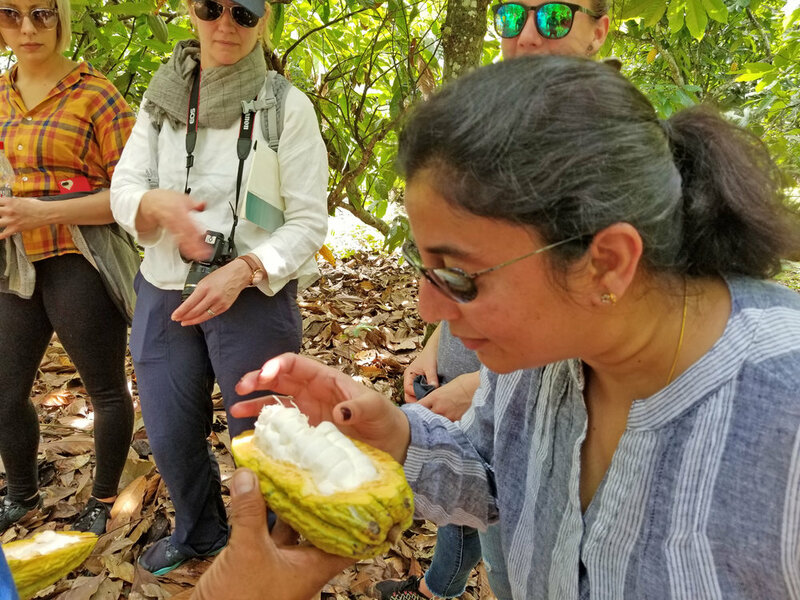 We wish to create a unique experience for our customers as they bite into that rich dark chocolate and enjoy the flavors indigenous to those tropical locales. Cocoa traditionally grows along the Equatorial belt; 15ºN and 15ºS of the Equator. The cocoa beans are collected, fermented, and dried by either the cocoa farmer or a collection agency. SORTING: to remove all debris. Separation by size to ensure consistent roasting. Enhances natural cocoa profile, some are more fruity than others that are citrusy or nutty. CRACKING & WINNOWING: The beans are crushed into smaller pieces and the husk is removed from the nib. GRINDING & CONCHING: The beans take on a more chocolate feel at this point; the nibs are crushed to a smooth fine paste between stone grinders, sugar is added, and ground to a fine smooth velvety texture. TEMPERING & MOLDING: to give a nice shiny smooth texture to the bar and a perfect sharp snap. The process generally takes 24 hrs to transform from a bean to a bar. But here at Dwaar Chocolate, like wine, we let the chocolate age a few months to ripen the flavors. This allows you, the chocolate enthusiast, enjoy the more robust flavors while the astringent acids vaporize. Drying beans under a permanent canopy in Puerto Quito, Ecuador. Temperatures inside reach around 80-90 F.
A good product always starts with good ingredients. The quality of the chocolate is determined by the quality of the cocoa beans. Why take someone's word for it when you can go to the source of the ingredient and experience it first-hand. In April of 2018, I visited two cocoa farms in Ecuador; in Puerto Quito and Esmeraldas. I had the pleasure of meeting farmers who work the farms to produce the best quality beans in the world. Majority of the ingredient suppliers work closely with the farmers and are often directly sourced without a middle man. Our cocoa beans are currently sourced from Fiji, Ecuador, Madagascar, India, Guatemala and Mexico. Dwaar Chocolate is a craft chocolate company located in Metro Detroit, Michigan that specializes in handmade bean to bar chocolate featuring unique flavors from around the world. COPYRIGHT © 2018 DWAAR CHOCOLATE. ALL RIGHTS RESERVED.